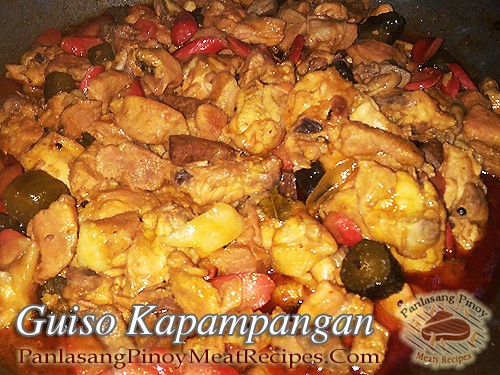 This is a delicious and easy to cook Kapampangan pork and chicken combo dish. I think many Pinoys will love this dish because of its sweet and sour taste because of the pickles and it is tomato sauce based dish. At first glance of this dish it will remind you of menudo because it contains hotdogs, pork liver, pork cubes and tomato sauce. But the taste is different from menudo or afritada which are also tomato based dish. You can also have an option to make it more savory by using cubed pork skin with a little fat at the beginning by sauteing it along with the garlic and onions until the skin is brown and rendered the fat. I think this is a technique of most Kapampangan to make their dish tasty and savory. But if you are health conscious or having some health issues, then I think it is better to omit this part. I think many Pinoys will love this dish because of its sweet and sour taste because of the pickles and it is tomato sauce based dish. In a medium size wok, heat cooking oil and saute garlic and onion until the onions are soft. Move the garlic and onion on side of the wok and saute pork liver for one minute and remove from the wok and set aside. Put the pork in the wok and season with salt and pepper. Stir cook for 2 minutes or until the pork are slightly brown. Then add the chicken with the pork and stir cook for one minute. Cover and simmer for 3 minutes. Uncover and add tomato sauce and stir. Pour half a cup of the pickle water and laurel leaves, stir and cover. Bring to a boil and simmer for 10 to 15 minutes. Uncover and remove the chicken pieces from the wok and set aside. Add the pickles in the wok and adjust the seasoning of salt and pepper. Cover and simmer for about 45 minutes or until the pork is tender. Uncover and add in the chicken, pork liver and hotdogs. Add other half cup of pickle water or adjust according to your preference. Simmer again for a few minutes and turn off heat. Serve with steamed rice.